Find Calvert Global Water Fund (CFWAX) review. This stock mutual fund invests in natural resources companies. There are varieties of sector stock mutual funds. They are including communications, financial, consumer cyclical, equity energy, health, industrials, real estate, technology, natural resources, etc. Investing in sector fund may provide high risk and high reward scenario for investors. Recently, Calvert Investment provides an advertisement about Calvert Global Water Fund (CFWAX) in financial newspaper. Whether you should invest in this sector fund or not, you should do your research. You can invest this mutual fund in your brokerage, retirement account (Roth IRA or traditional IRA), etc. 1. A water crisis is engulfing the world. 2. Innovative companies are creating innovative solutions. 3. Water is an investment theme wit staying power. 4. The Fund is a proven way to access the water opportunity. 5. Calvert is the preeminent name in sustainable investing. The objective of this Calvert Global Water Fund (CFWAX) is to seek growth of capital through investment in equity securities of companies active in the water-related resource sector, in accordance with its corporate responsibility standards and strategies. This Calvert Global Water fund has total net assets of $389.4 million. The dividend is almost insignificant, 0.03%. The annual expense ratio is 1.85%. The fund’s CUSIP is 13161P797. The other classes of this equity fund are Class C (CFWCX) and Class Y (CFWYX). The top holdings as of January 2014 are United Utilities Group Plc (6.7%), Sulzer Ag Reg (6.24%), Ebara Corp (5.29%), Cia Saneamento Basico De Adr (5.10%) and American Water Works Co Inc (4.93%). United States is the top country with 48.21% of total investment. 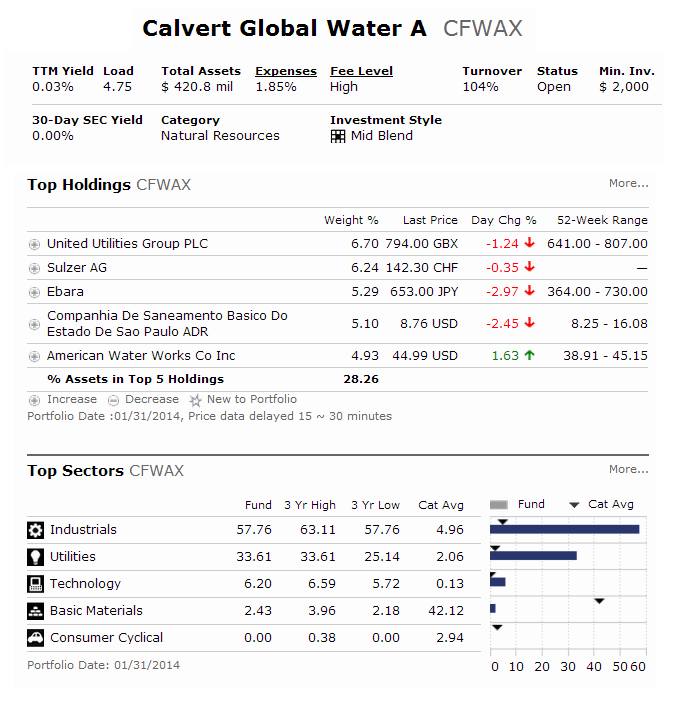 This Calvert Global Water Fund (CFWAX) is ranked among the best natural resources mutual funds. It has a high turnover portfolio ratio. The dividend yield is low and not suitable for income seeker.